Another recipe from the wonderful Chinese Herbal Cookbook , published in England, which combines Chinese herbs with European recipes. One odd thing about this recipe is that it doesn’t give a weight for the fish. Lemon sole fillets are native to Northern Europe, so are not a good choice for Californian locavores. 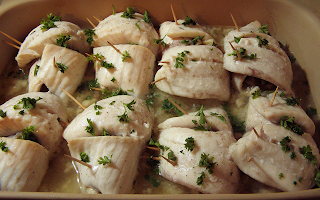 Luckily this recipe is surprisingly versatile: summer flounder (on US east coast), black cod (sablefish), and tilapia (west coast) are all good substitutes that are sustainably harvested--although the name “Rolled Tilapia” sounds considerably less poetic than “Rolled Sole.” The trick is to get uniformly sized fillets, so they all cook evenly. I used rather large (~1/2 lb. each) tilapia, and would not go larger. You’ll notice it takes several toothpicks, but I’ve found that to be true with fillets of all sizes. Functional but not elegant, you can remove the ‘picks before serving. I also had 10 oz. 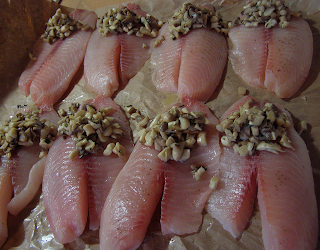 mushrooms on hand, which helped fill the large fillets. Instead of salt, I use Spike , which adds some extra flavor to the wine and stock. Otherwise this dish can be rather bland. You could also substitute other fresh green herbs such as oregano or thyme for tarragon, or use 1 tsp. dry tarragon in the stuffing and garnish with parsley, as I did. Since fish stock is rather hard to come by, I typically substitute either chicken or veggie broth, or a combination. I recently learned that what is called cornflour in the UK is called cornstarch in the US. In the past I used flour from corn (oops!). This time I used cornstarch. Neither seems to do much, so next time I’m going to try eliminating that ingredient. The “Chinese herb” in this dish is the oyster mushrooms. According to the Chinese Herbal Cookbook, they are traditionally used to strengthen veins, relax the tendons, and ease aching limbs. Recently they’ve been proven to strengthen the immune system. My husband says this combination of benefits is just what I need. Melt butter in a frying pan and sauté mushrooms over medium heat for 5 minutes, then season with salt and pepper and add half the tarragon. Sprinkle salt and pepper over each fish fillet and lay flat. Spread sautéed mushrooms over fillets, roll them up and secure with fine kitchen thread or toothpicks (known in the UK as wooden cocktail sticks!) Place rolled fillets in buttered ovenproof dish, preferably with cover. Garnish with remaining tarragon. (I used parsley.) Serve with plain rice and mangetout (snow peas) or green beans.